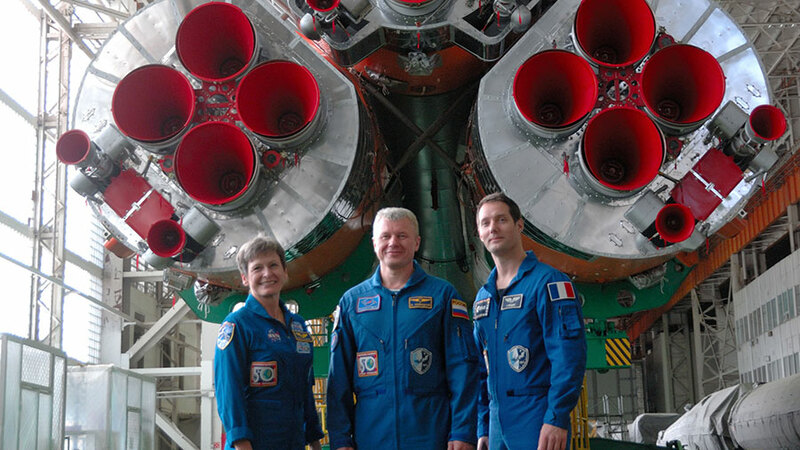 Expedition 50 crew members (from left) Peggy Whitson, Oleg Novitskiy and Thomas Pesquet stand in front of the first stage engines of their Soyuz booster rocket. NASA announced today the crew members chosen to launch on four upcoming missions to the International Space Station. Meanwhile, three Expedition 50 crew members are orbiting Earth today working on cargo operations, human research and awaiting the launch and docking of three new crew members this weekend. New space station crews were officially announced today that will launch to the station in 2017. Four NASA astronauts, four Roscosmos cosmonauts and one astronaut each from the European Space Agency and the Japan Aerospace Exploration Agency are scheduled to launch in March, May, September and October of next year. Commander Shane Kimbrough is nearly complete with Cygnus cargo transfers and will close the hatch this weekend. The Cygnus space freighter from Orbital ATK is on track to be released early next week from the Unity module. NASA TV will cover the event live when the Canadarm2 grapples Cygnus and releases it for departure Monday at 8:20 a.m. EST. Flight engineers Andrey Borisenko and Sergey Ryzhikov recorded their food and medicine consumption again today for the Morze hormone and immune experiment. Borisenko then moved on to transferring cargo from the Progress 64 resupply ship while Ryzhikov checked lights and cleaned vents and fans. Back on Earth, two veteran station residents and a new space flyer are two days away from launching aboard a Soyuz MS-03 spacecraft to begin a five-month mission on the orbital complex. First-time European Space Agency astronaut Thomas Pesquet will join NASA astronaut Peggy Whitson, who will be on her third mission, and cosmonaut Oleg Novitskiy, who will be on his second mission, Nov. 17 when they lift off and take a two-day trip to their new home in space. With plans to expand the crew from 6 to 7, why two Soyuz flights with only two crew? If Roscosmos doesn’t want the seats, why not fly more NASA or International partner crew? With HTV and Commercial Cargo flights in full swing, it hardly seems logical to substitute a tiny amount of cargo for a crew member on a Soyuz. Good question. The Russian crew reduction is temporary. It is anticipated that the Russian crew will remain at two only until the launch of the Russian MLM module. The plan to expand the crew in the U.S. segment to a complement of four crew members will continue as planned once U.S. commercial crew spacecraft come online. As far as NASA or an international partner using the empty Soyuz seats, we will work with Roscosmos and the other partners to evaluate options as changes are made to the plan.